Last night, the four of us went swimming at one of our neighborhood pools. Evening is my favorite time for that. There are usually just a handful of others using the pool, and by the time we leave, we sometimes have it all to ourselves. A bonus is that no one needs sunscreen. The pool sits high on a hill, with a view of the valley and the city lights of Phoenix. When we get there in time, it’s the perfect place to watch the sunset. Last night, the sky was already dark, and a curve of moon, not quite new, leaned against the sky to the west. The kids jumped in right away, and their squeals of laughter echoed in that way that sound does when it bounces off water, how it sounds both empty and full. We played a spirited game of tag, in which I was reminded just how tricky and smart my kids can be. We kicked around and treaded water and swam a few strokes. Waited for the next cannonball from Boy. So to be almost sure of what we’re going to do feels like (at the least) I’ve got the stake raised above me, ready to drive it into place. But guess what? I let that all go last night. A whole hour or two unspooled without those worries invading my mind. After we swam for a while, I asked Mr. H to keep an eye on both of the kids and went off by myself. I lay back in the water, relaxed and weightless. Above me, the Big Dipper scooped its share of the sky. Birds (swallows, I think) swept through the air, dining on the bugs that were drawn to the lights around the pool. The moon sank by small degrees toward the horizon. I decided that my troubles could just fit into the curve of it, so I settled them there and watched the moon fall beneath the roof line. For long minutes, I floated, looking at the sky. It’s something I don’t do enough, not at night. Our days here are like banners of blue (as long as you don’t look toward the fuzzy cloud of smog that hangs over downtown). And at night, we’re far enough out that we can see a decent batch of stars. The sky isn’t crowded with them, but we can find the constellations easily enough, and even see the brightest meteors when they come along. They are simple words, and true. True for me, at least. I’ve always gone weak-kneed at the come-ons of blinking stars and a slow moonrise, though my true love is a moonset. So maybe I’m a liar, after all. As much as I cry after wanting roots, my soul seems to sing for things that are suspended, for things that orbit the planet or shoot through the sky. For birds that swoop and feast in midair. For the feeling of floating, as though the next current could change things. Those feelings are self-indulgent and not the least bit practical. I know it. They’re a splurge, and I know that, too. But they cost nothing, and there’s no show-off to them at all. If I didn’t write this down just now, it would never come up in a conversation between us, these prizes I take for myself. (We all have things like that, small joys that seem too much, our naked hunger for beauty too embarrassing when said out loud.) But there’s enough for everyone when we keep it simple. When all it takes is to step outside and to let the sky take over. Maybe all I need is a tether. A long bright shiny thread that holds me to my place and lets me wander as far as I need to, with the sound of my children’s laughter as my compass. I’ll plant the stake and tie myself to it, with lots of slack. Our roots will sink deep. When I need to feel light, I will step outside. But I won’t go far, I think. I won’t need to. Not when there are moments like last night. Not when I can find a way to float. I’m in that crazy loose land too, knowing we will move, but not knowing how and when exactly. More questions than answers. But it’s nice when you have a reprieve from it all. Only in AZ can you float quietly at night in a pool and watch the moonshine, without freezing to death. You and I need to go have wine. This was beautiful. Can’t wait to hear what you decide. Jesus, I don’t even know how to begin to tell you all that I love about this post. It’s packed with nuance and yet so centered. I’m . . . speechless. Will you forgive me for being glib? Maybe you should move to the moon, or at least the International Space Station! The only other thing I can say is that your imagery in this post is rich. Too rich to give adequate comment. Beautiful is the only word that comes to my head, but it isn’t enough. I love looking up into the night sky, I love time alone, I love floating, I love swimming at night. Good for you for remembering to take care of yourself. Please teach me how. You’ve hit it for me. I need a tether. 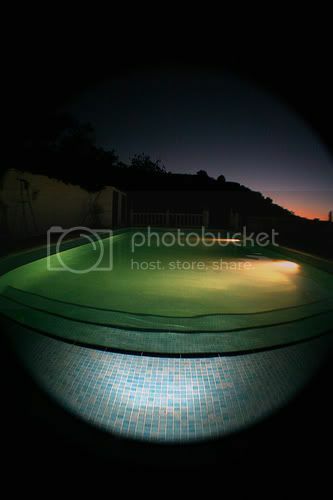 Beautiful…I used to love visiting the pool at night – something about floating in the swirly blue light with the moon casting tree shadows around. Thanks for bringing back a lovely memory…it’s been a rough week and your post was very calming. Tinas last blog post..Good Night Nurse! also, i’m sorry, but the image of you with one of those little kiddie leashes on came to me when i read the part about being tethered…. i know. i’m a bad person. Lovely. Eloquent. Thanks for sharing this. What a lovely, almost poetic post! I haven’t gone swimming at night in such a long time. I love your ring and moon quote. ByJanes last blog post..It’s the witching hour…. My favorite post of yours I’ve read. I want to go swimming by the light of the moon. If only it would quit raining here in Seattle. Oh yeah, you were “Nightswimming”! I can almost feel you floating on the water, dreaming under the moon. I love that feeling! I tried to write something but this seemed more appropriate than my own words. Beautiful post. Starting to believe that beautiful is a word I will associate always with your writing. man! you are a writer! so good. a moonlit walk on a beach and laying on the roof looking at the stars are both on my short list of things to do one day! For our anniversary a few years ago Husband gave me a necklace of Janine’s which he refers to as the fishing lure .. because of the little ‘bead’ that is engraved: who so loves believes the impossible. Thanks for the head getaway that you seemed to produce for me. I loved it. What a heavenly setting with the family. I just think it sounds just like a memorable experience for you all. This post reminded me of one of my favorite REM songs, “Night Swimming.” Have you heard it? Beautiful imagery, my friend. Just lovely. There was a movie about Beethoven (Immortal Beloved?) in which he escapes his house in the middle of the night to avoid his abusive father. He goes to a pond and floats face up looking at the sky. The pond reflects the starry night and as the camera zooms out, Beethoven becomes part of the sky and then the universe, all to . That scene took my breathe away. I, myself, am partial to full moons – the harvest moon, especially. Beautiful. Just perfect and beautiful. Nap Wardens last blog post..Showin’ Your Spanx? That sounds so peaceful. Love the picture. Beautiful post, Jennifer. Thank you for sharing and taking us there with you. My thoughts and prayers are with you in what is weighing on you. Wishing you luck in finding your tether. I want to say what everyone said before me. This was a fantastic post. Your writing is like poetry; thick with imagery that dazzles all my senses. Just beautiful. I hope that the stars align for you and your life is filled soon with more answers than questions. Carolyns last blog post..before you speak. Ah, yes, and the feminine aspect of the moon, I can feel that connection for you as well. You are an amazing woman. Love the pool (or any water) at night. My minister quoted that exact same phrase about 3 times in his sermon a few weeks ago… and he’d pause afterwards, and let it sink in. Beautiful. Lovely post. It seemed to recall, for me, all of the times I’ve moved to new cities – and how each time I felt so refreshed, instantly transported into a phase of discovery, a clean slate. Though eventually, each time, those feelings wore off – and I realized how fickle they were, but fun nonetheless. But, it reminds me of feeling untethered – this moving thing that I’ve done many times – and it can be liberating. If I could only capture that untethered feeling a bit more easily…huh? I loved closing my eyes and being at the pool with you. The mild waters took the sizzle out of the day as the sky changed color. I could hear all the little bug desert sounds on a very soft slight breeze. Thank you. Jules~s last blog post..Blogging with Purpose…. I loved the images you created here. When I was a little girl I loved to swim underwater while in the pool and imagine that I was somewhere else. As an adult, I float on my back in the Atlantic ocean, stare at the sky and contemplate where I am and where I am going…existentially speaking, of course. There is something incredibly soothing about the sensory deprivation of being in water. BTW, this week I’m giving away a subscription to Budget Travel magazine as a further inspiration to The Grand Tour theme! Stop by and tell me where you want to go on your dream holiday. Suzannes last blog post..Our First Giveaway! Love your wanderlust spirit and way with words Jennifer. Thank you so much for bringing us along. For a few seconds, I really felt as if I were there. It was beautiful. This is the first time I’ve read your blog (as a result of your posting my first ever comment! – thank you). I almost commented on poker. It seems we both grew up in Missouri, and like you, I spent countless Friday night / Saturday mornings playing poker (or, occasionally, Pinochle) with my rough n tumble family. These get-togethers usually involved rivers of spirits and an early breakfast feast of biscuits n gravy, fried eggs, and potatoes with onion. My mom is a great cook! I miss those nights almost as much as the lightening bugs. But this post… This is the one I had to comment on. It was a meditation for me. I was transported. You are truely talented. Thanks again. PS. Featured on Good Mom/Bad Mom on the Houston Chronicle.